There’s something magical about an October sunset. Low, golden light ignites red geraniums, apples, and red maple leaves with an inner fire. The landscape transforms into an open treasure chest of sparkling gemstones. 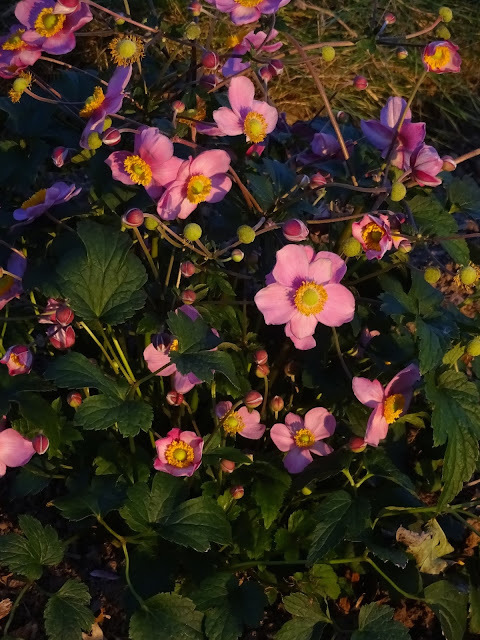 Among the most beautiful is the pink Japanese anemone. One fine fall day twenty years ago, her airy personality caught my eye while strolling Shakespeare’s Garden in Stratford, Ontario. Smitten, I posed with my husband for a photo before her masses of blooms five feet high. Pink has always been my favorite color. So peaceful and soft. “The mystery of a single flower”, as John Ruskin said, possessed me until I found a greenhouse that stocked plenty anemones. Garden designers say uneven numbers arrange balance in small to large spaces, so I planted three healthy anemones around our pergola. The two plants in full sun thrive; the third under the lilac tree vanishes. Perhaps the tree’s roots deprive the anemone’s rhizomes of necessary nourishment. In search of answers, splayed open before me is a book I bought in Stratford titled Portraits of Flowers. The artist, Gerard Brandis, provides growing conditions and illustrates each plant with an intricate woodcut of his creation. In another book, A Gathering of Flowers from Shakespeare, Brandis pairs his woodcuts with flowers mentioned in the bard’s poetry and plays. I savor both books with fine chocolate and Earl Grey tea, dream of blooming “windflowers” my height. Of the Ranunculaceae family, windflowers include buttercups, delphiniums and clematis, all native to the Mediterranean, as is lavender of the Lavandula family. My land will not grow delphiniums, and the clematis teases me with a season or two and then gives up the ghost. “Fall is the best time to plant, but given our rough winters most catalogues sell them in spring; the confused anemones may not flower until next May—if they survive,” says Brandis. Since I prefer punctual windflowers, today I planted and composted six new pink anemones, three in two different gardens. Then I transplanted several Hidcote lavender shrubs close by for companionship, seasonal color, and fragrance. Hidcote blooms in July—the Japanese anemone in September-October. The low, bright green foliage and slender stems of the anemone should contrast just fine with the compact, grey-green lavender shrub. Dear Reader, wouldn’t you know—as I tamped soil around the last lavender transplant, a gorgeous sunset splashed autumn’s daughter of the wind with gold dust. I rested my gloved hands atop the shovel’s handle, warm sun on my back, and admired her yellow face and pink petals. “Now, you two, please grow and love thy Mediterranean neighbor,” I said, and called it a magnificent day.